Antony Brajdic started Andona Guitars in 1995 in Croatia, after learning under legendary European luthier Rolf Spuler and working for Warwick, building basses. 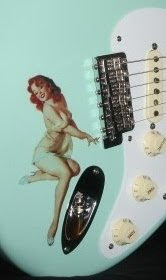 Pictured is the Missing Link model (a midi guitar), one of two Strat-type models from Andona. Besides having an exceptionally high standard for wood and materials, Brajdic is also into polyphonic/hex pick-up technology. The bridge in the photo features his Polyharm Hexophonic Piezo System. The body edges & contours of this model sort of combine style elements of the Ibanez Satch with the PRS DC. Click the image for more photos. The headstock has a pretty standard shape (whew!). The Andona line also includes archtops, basses and a few other aesthetically well crafted models along with another Strat-type, called the Remake. Be sure to visit the website!